The science on fats is changing as rapidly as today’s fashions. So work hard to know your fats—from bad to good. Think you’re in step with the latest in fat science? If you’re still preaching low fat to your patients, perhaps you need to brush up on your fat knowledge. Low fat is as out of fashion as shoulder pads. Today’s nutrition advice should be all about healthy fats. “I think the fat phobia of the ‘90s is old school now. Dietitians need to keep up with the research. We should not really be recommending low fat anymore. There is tremendous value in olive oil. Dietitians need to know this concept and to recommend that their patients consume good fats. People can have an enjoyable diet with food that tastes great. Dietitians need to be aware of these issues and incorporate them in their work,” says Janet Bond Brill, PhD, RD, LDN, a nutrition and fitness consultant and the author of Cholesterol Down: 10 Simple Steps to Lower Your Cholesterol in 4 Weeks — Without Prescription Drugs. If keeping up with research on fat is challenging for nutrition professionals, you can imagine how confusing it is for the public. First it was low fat, then zero trans fat, and now it’s a push toward monounsaturated fatty acids (MUFAs). “Absolutely, there is confusion in the public over fats,” says Brill. And it’s time to set them straight. “There is general agreement that about 30% of total calories should come from fat,” says Joyce Nettleton, DSc, editor of the Fats of Life newsletter and PUFA Newsletters. The American Heart Association (AHA) suggests that 25% to 35% of total calories should come from fat. Brill reports that within the total fat intake, 7% of calories or less should come from saturated fats, less than 1% should come from trans fats, at least 10% and up to 20% of calories should come from MUFAs, and the remaining amount (up to 10%) should come from polyunsaturated fatty acids (PUFAs). “The message needs to be made loud and clear that saturated fats, cholesterol, and trans fats need to be avoided. These are the three things that contribute to heart disease, which is our No. 1 killer among men and women,” says Brill. Suggestions for limiting dietary cholesterol and saturated fats have existed for decades. We know that saturated fats increase low-density lipoprotein (LDL) cholesterol levels, thus increasing the risk of heart disease. And during the past few years, the public has been hit over the head with the message that trans fats are the bad guys, since trans fats raise LDL cholesterol and may lower high-density lipoprotein cholesterol. While saturated fats may not be totally eliminated from the diet because they are found in foods that provide important nutrients, such as animal and dairy products, artificial trans fats can be phased out. Naturally occurring trans fats are found in very small amounts in animal products, but most of the trans fats people consume are found in processed and restaurant foods, which can be produced using healthier oil formulations. “Hopefully, we are getting trans fats out of the food supply. We need legislation like Denmark, where it is banned in the entire country. California state legislation against trans fats is a great step,” says Brill, who advises her clients to look for and then avoid sources of hydrogenated oils on all ingredient lists before choosing foods. Today, we face new challenges with upholding the strategy of lowering saturated fats. The elimination of trans fats from food production has reintroduced saturated fats as a functional solution to food processing. Even home cooks are turning more frequently to butter as a baking alternative in an attempt to avoid trans fats. And although the high-protein diet has lost its initial gloss, it promoted a lingering notion that eating larger portions of animal protein, with their accompanying contribution of saturated fat, is a “lean” way of eating. The solutions to these issues are not always clear. For example, Nettleton reports that palm oil, an increasingly common fat that food manufacturers use to replace trans fat, is rich in palmitic acid, which for the most part has no effect on blood cholesterol levels. But many experts still recommend avoiding palm oil because it is a source of saturated fat. And when people are reaching for a suitable fat for their favorite chocolate chip cookie recipe, which presents the lesser evil: saturated fat in butter or trans fat in stick margarine? Navigating these challenges may be best accomplished by analyzing individual lifestyles and making recommendations accordingly—something at which dietitians are skilled. The “budget” approach to saturated fats is an option. How do you want to spend your saturated fat allotment for the day: on really good cheese, filet mignon, or homemade cookies? Trans fat may be a nonissue for someone who enjoys cooking and eating at home, but it can pose difficulties for people who regularly eat out of food packages and from fast-food drive-throughs. “It depends on people’s food habits. It comes down to individual food choices and everything in moderation,” says Nettleton. The new shift in fat science focuses on the fact that the Western diet is flooded with the omega-6 fatty acid linoleic acid and is low in omega-3 fatty acids, an eating style that appears to be proinflammatory and conducive to chronic disease. As people were urged to increase their intake of polyunsaturated vegetable oils to reduce blood cholesterol levels in decades past, there was a tremendous increase in the agricultural production of oil seed crops, primarily soybean. Estimates indicate that 20% of the calories in the American diet come from soybean oil alone. The vast majority of liquid vegetable oils used in food processing, such as soybean, corn, and safflower oils, are high in omega-6 fatty acids. “We need to get our omega-6 fatty acids way down. Right now, they are at a ratio of 20 to 30:1 omega-6 to omega-3 fatty acids, and they need to be at a ratio of 4:1 or lower,” says Brill. “At the same time that we need to decrease omega-6, we need to increase long-chain omega-3 fatty acids. Epidemiological studies show overall heart health with high PUFAs, but we need higher levels of long-chain omega-3 fatty acids to offset the high levels of omega-6. If we didn’t have such low levels of long-chain omega-3 fatty acids, the high omega-6 intake wouldn’t be so problematic,” adds Nettleton. “The best strategy for getting a more positive ratio of omega-6 to omega-3 fatty acids is to eat less linoleic acid and increase omega-3 fatty acids. We need to replace these oils with olive oil as the main fat, which is part one. The No. 1 oil for home use should be olive oil; it can be used in salad dressings and cooking. For baking, canola oil is a good choice,” says Brill, who also notes that extra-virgin olive oil is an even better choice than regular olive oil because it has not been treated with excessive heat or solvents. Thus, it offers an added bonus of polyphenols and antioxidants. MUFAs are found in canola, olive, peanut, and sunflower oils, as well as avocados, seeds, and nuts. But it’s difficult to find MUFAs as the main source of fat in processed foods, so focusing on whole foods and cooking at home is paramount. “There should be an emphasis on monounsaturated fats in cooking use, such as canola oil and olive oil. Minimize the use of corn, soybean, and safflower oils, as you’ll get mostly linoleic acid,” adds Nettleton. “Part two is bumping up omega-3 fatty acids by getting daily doses of plant omega-3 fatty acids such as flax and walnuts and marine sources of omega-3 fatty acids, DHA [docosahexaenoic acid] and EPA [eicosapentaenoic acid], by eating fatty fish at least two to three times per week. This shifts the physical environment away from a high omega-6 ratio, which promotes a proinflammatory situation conducive to blood clotting and chronic disease,” says Brill. Unfortunately, the conversion of the plant form of omega-3 fatty acids, alpha-linolenic acid (ALA), to long-chain omega-3 fatty acids is modest at best. “Plant sources of omega-3 fatty acids are not equivalent to the long-chain omega-3 fatty acids DHA and EPA. People should target 500 milligrams per day of long-chain omega-3s,” says Nettleton. “There is significant research pointing out that ALA has tremendous health benefits. Even though the conversion rate to long-chain omega-3 fatty acids is low, I say get it in the diet anyway. These plant sources of ALA are very healthy foods, and we haven’t fully discovered yet how they provide such great value to health. Perhaps there is some other mechanism other than conversion by which they provide benefits,” says Brill. Nettleton points out that ALA can help redress the balance of omega-6 to omega-3. But if people rely on ALA exclusively, they will not get the tremendous benefits specifically linked with long-chain omega-3s. In the end, it seems dietitians have their work cut out for them trying to simplify the complicated science on fats for the public’s easy digestion. But it looks like the stars are aligned for doing so. Chefs are warbling their praise for extra-virgin olive oil, the Mediterranean diet is as hot as ever, and there seems to be a newfound respect for healthy food that tastes great. 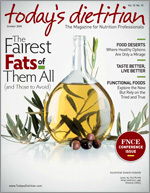 “The public is slowly but surely realizing the value of adding healthy fats to the diet. You can see it in the popularity of the Mediterranean diet, and the American Heart Association is no longer concentrating on low fat but on healthy fats,” says Brill. “It’s time for an oil change in this country,” says Janet Bond Brill, PhD, RD, LDN, a nutrition and fitness consultant. Check out this profile on popular cooking oils to see how they rate for their fat ratios and cooking properties. Rich olive taste, low smoke point. Best in dressings, marinades, sauces, sautés, pastas, casseroles, stir-fries, soups, and meat dishes. Brown colored with hazelnut flavor, high smoke point. Best used to bring out flavor in baked desserts, dressings, and meats. Light avocado flavor, high smoke point. Best in salad dressings and marinades, sautés, casseroles, pastas, and meats. Light color and flavor, moderately high smoke point. Best for baking or in dishes that require a mild flavor. Peanut flavor and aroma, high smoke point. Best in foods that benefit from peanut flavor, such as Asian stir-fries, noodles, rice, and salads. Light and mild sesame flavor, moderately high smoke point. Best in Asian stir-fries, noodles, rice, and salads. Red-orange color and unique flavor, high smoke point. May bring out the flavor in Caribbean and South American dishes but is moderately high in saturated fat. Light and mild flavor, high smoke point. Best used in baking or deep-frying but is high in linoleic acid. Slightly heavy flavor, high smoke point. Best used in baking or deep-frying but is high in linoleic acid. Light and flavorless, high smoke point. Best used in baking but is high in linoleic acid. Rich walnut flavor, moderately high smoke point. Best used to bring out flavor in baked desserts, dressings, and meats. High in alpha-linolenic acid. Mild flavor, high smoke point. Best in sautéing or frying but is high in linoleic acid. Light color and flavor, high smoke point. Best for searing meats, baking desserts, and deep-frying foods but is high in linoleic acid. Solid at room temperature, buttery texture, low smoke point. Popular in southeast Asian dishes but is high in saturated fats. *Note: Sorted in descending order of monounsaturated fat level. Fat levels and smoke points may vary depending on variety and oil refinement process.